Salesforce CRM for Wealth Management. Learn what makes it one of the most popular Advisor solutions on the market. It’s cloud-based, meaning no hardware or software to install, backup, and maintain. Easily manage client relationships, build your book of business, streamline practices and handle compliance challenges. Industry leaders like TDAmeritrade, E*TRADE, and United Capital Financial Advisors are jettisoning stand-alone legacy systems and choosing Salesforce CRM. 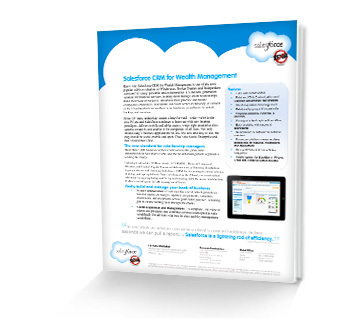 Read the Wealth Management White Paper to get the full details on what makes Salesforce CRM for Wealth Management a sound investment in your future.